Could your local doctor diagnose heart disease using a handheld ultrasound device? Many potential heart patients that are referred to specialists, turn out not to need specialist care. If general practitioners (GPs) could use handheld ultrasound devices with built-in diagnostic tools, could this improve patient outcome and reduce cost for the health services? Heart failure is among the most common reasons for hospitalisation and constitutes a major public health concern. The number of patients with heart failure is expected to increase due to prolonged life expectancy and improved treatment of medical conditions. Cardiac ultrasound (echocardiography) is one of the main tools for evaluating heart disease such as heart failure, valve disorders and fluid around the heart (pericardial effusion). An accurate diagnosis should be made as quickly as possible to preserve the health and quality of life for the patients, as well as to keep down costs and save time for the healthcare services. Currently GPs upon suspicion of heart disease, refer patients to a cardiac specialist, and most often echocardiography is the next diagnostic step. However, for several cardiac conditions, the diagnostic accuracy is only modest when based on medical history and clinical examination alone. Therefor a significant proportion of the patients referred do not actually need follow-up from a specialist. This takes up valuable places from those patients who do need specialised care. Smaller and cheaper ultrasound devices have been developed during the last decade. These handheld ultrasound devices can be brought to the patient, and allow for diagnostic imaging at the patient’s point of care. The small size, low cost and easy access of handheld ultrasound has enabled inexperienced users to perform ultrasound diagnostics outside the conventional laboratories. Significant efforts are being made to improve the diagnostic accuracy of handheld ultrasound. This can enhance the art of clinical examination by revealing disease at an earlier stage, and help the GPs to better identify patients in need for specialised care. 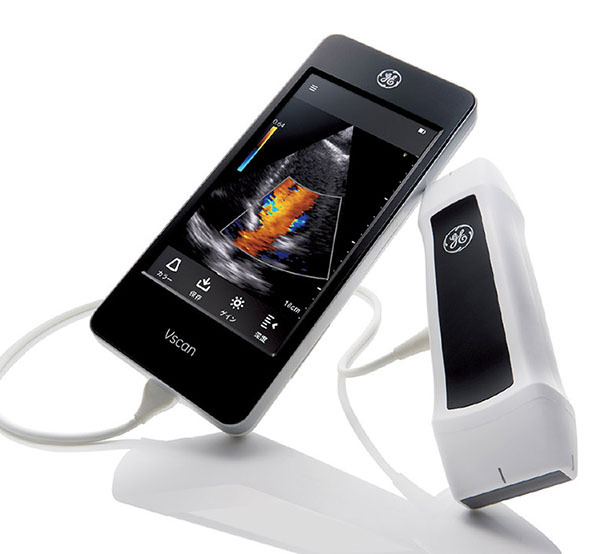 Here at the Centre for Innovative Ultrasound Solutions (CIUS), we have evaluated the Vscan handheld ultrasound device from GE Ultrasound. Several studies have been conducted, most of them in collaboration with the Department of medicine, Levanger hospital. Studies show that the use of handheld ultrasound improves diagnostic accuracy by experts, residents, GPs, medical students and dedicated nurses. Compared to handheld ultrasound used by specialists, the diagnostic accuracy is somewhat lower when the users are inexperienced, but with education and training accuracy can be improved. In one of our upcoming projects, we have trained five randomly selected GPs in the use of diagnostic cardiac ultrasound using a handheld device. Each of the physicians has received theoretical education and at least five days of practical training. Patients with signs and symptoms suggesting heart failure will be included in the study after giving their informed consent. In total, 150 patients will be included in the study. Firstly, the patients will be examined by a GP. The same physician will then perform a focused cardiac ultrasound using handheld ultrasound. The GP will interpret the images as well as transfer the recordings for expert interpretation using a new telemedicine solution. The function of the left ventricle (the main cardiac chamber) will also be analysed automatically by two new methods integrated in the handheld ultrasound (see animations below). The accuracy of the different diagnostic steps will be compared to a standard echocardiographic examination performed by experienced cardiologists. Automatic tracking of the basal part of the left ventricle. Automatic tracking of the left ventricle borders to estimate the ejection volumes of the heart. We believe that the use of focused cardiac ultrasound by GPs using handheld ultrasound, supported by either automatic analysis or by experts per telemedicine, can improve diagnostics and allow for better treatment of patients. Furthermore, we aim to evaluate the cost-utility of the innovative diagnostic algorithm, which may better select patients in need for follow-up by specialised healthcare services. Can light help to develop effective anti-cancer vaccination?